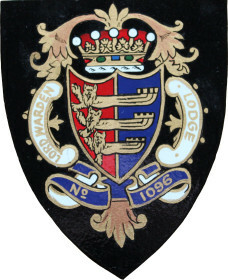 The Lodge having been allocated Number 1096 and designated “The Lord Warden Lodge”, needed a Lodge Jewel bearing a crest. The “DEXTER” half of the English Arms was joined to the “SINISTER” half of the shield of the PORTS, producing a SHIELD parted vertically RED and BLUE and containing THREE GOLDEN LIONS tailing into THREE SHIP’S STERNS. This is surmounted by an EARL’S CORONET, which is that of the EARL GRANVILLE, K.G., who was the LORD WARDEN OF THE CINQUE PORTS in 1866 when the Lodge was consecrated. The Lodge Crest can be clearly seen on the “Past Masters” Jewel (far right). This Jewel is presented by the Lodge to Masters when they vacate the Masters Chair at the end of their year serving as Lodge Master. It is worn until a member is promoted with Provincial Grand Lodge Honours. When it is then handed back to the Lodge.